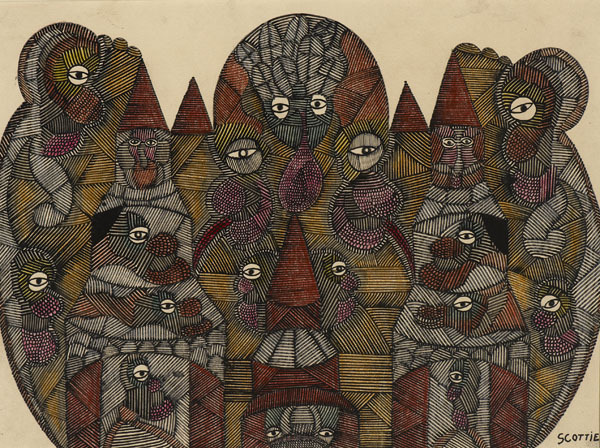 Born Louis Freeman, Scottie Wilson was a Scottish-Jewish, self-taught ‘outsider’ artist, known for his highly detailed style. After leaving school at the age of 8 to help subsidise his family's meagre income, he later served in the army in India and South Africa, leaving in 1911 but rejoining during the First World War. Afterwards he emigrated to Ontario, Canada, where he ran a shop and discovered his passion for art via doodling. He developed a highly personal style and his own characters - ‘evils and greedies’ - whom he juxtaposed with naturalistic symbols of goodness and truth. He began exhibiting in Canada then moved to London, spending his remaining years in Kilburn. His work was admired and acquired by Jean Dubuffet and Picasso.